I never have been into lemon bars. I like them, but they aren’t anything amazing to me. Lime is much more up my alley. Awhile back I decided to play around with the idea of a lime bar. 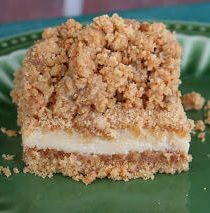 I loooove a yummy graham cracker crust and I love crumbles on top of things so I decided to give it a whirl. Hubby thought there was too much crumble on top, but like I said, I love it! 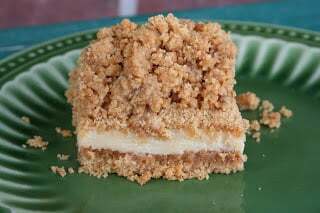 The graham bottom and crumble were all buttery and delicious while the filling is creamy and has that lime zip to it. A for sure must before the summer weather is gone forever! Also, if you happen to have a favorite lemon bar do share because I would love to find a yummy version! What Is the Difference Between Key Lime and Regular Lime? Key limes are smaller than the standard Persian limes and have thin, leathery skin. Key limes are tart, sharp and incredibly sour, even more so than other limes. Can You Use Regular Limes Instead of Key Limes? If you cannot find Key limes, you can substitute regular limes in recipes. Or, you can substitute a combination of regular fresh lime juice and fresh lemon juice in equal proportions. What Can You Substitute For Sweetened Condensed Milk? You can substitute 1 can (14 oz) of sweetened condensed milk with ½ cup of evaporated milk plus 1 cup of sugar and 2-3 tablespoons of melted butter. Combine flour, sugars, graham crumbs, salt and baking powder. Press half into an 8×8 or 9×9″ greased baking dish. Pour milk mixture on top and sprinkle remaining crumbs on the filling. Bake 25 min or until the top begins to turn golden. You can make these with as little or a lot of the topping as you like.